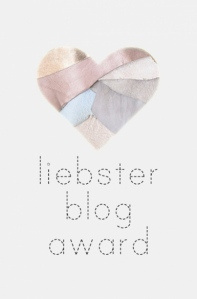 This helpful post discussed this award and its history and various versions here. 1. What’s the best book you’ve read in the past few months? Not including all the sewing books I regularly pore over, I read “The Boy who Loved Apples”, a mother’s story about her son’s battle with anorexia. It was really good. 3. What’s your favorite thing you’ve made, cooked or baked in the past few months? Whatever I made last is pretty much my favourite. I am easily pleased and rather fickle as to the whole ‘favourite’ thing. 4. What’s the most special piece of clothing you own? Why do you love it? I am not really attached to anything. I have some heirloom pieces of fabric and lace inherited from my grandmother that I really like, but there is nothing I would rush back into a burning building for. 5. Do you have any family heirlooms? I do, but see Question 4. Probably do my blog reading. I have my phone on hand and I really like to sit down with a cup of (home roasted) espresso coffee, black, no sugar, and read my blogroll. 7. What’s your ideal/ fantasy vacation? Before children I would say a multi-day hike in some beautiful wilderness carrying everything on my back. Actually, I would love to do that now but sadly it is a fantasy as I have some physical limitations that mean carrying heavy loads and long walks are a problem for me. One day, maybe. 8. Have you made any new family or personal traditions recently? 9. What’s your favorite creative outlet? 10. What’s one aspect of yourself that makes you really proud? I stood yesterday, I can stand today. (Dorothy Dix). Plus I am a fast learner. This is useful. 11. If you could have any job in the world, what would it be? Exactly what I am doing right now is ok with me. I am still too new to sewing to have a favourite pattern. Crochet I usually do something my own design or so heavily modified it bears no resemblance to the original pattern. But I am pretty fond of the Miz Mozelle dress pattern and I also like the Simplicity 1880 shirtdress with the modified skirt, I’ll probably make both those again. 2. What was the last thing you made? 3. What is your favorite print? (dots, stripes, floral) Or, do you like solids better? If you like solids, what’s your favorite color? I really like polka dots and florals, but also love a good solid, they are more practical and versatile. I love navy and vivid green, like a Kelly green. Kids, chaos, school run, chaos, cleaning, laundry, more laundry, various work (at home, on computer, rather techy), school run, cooking, more cooking, oh, and sewing or crochet any spare moment I get. Very boring, actually. A mountain top looking upon distance is pretty good. 6. What do you do when you’re feeling down? Crochet. Its so zen and is my meditation. Also, Prayer. 7. What is your crafting space like? I have been sewing squeezed into a corner in the lounge room, but just this week I am moving I have moved into the spare room. Its awesome. 8. Which blogs do you look to for inspiration? Look to the right. I read ALOT of blogs and they all inspire and encourage for different reasons. 9. Would you rather live by the sea or the mountains? I am a mountain girl. I was born and raised at Fitzroy Falls, NSW and it has left me with a deep love of the mountains. Simple clean food, with great flavours and textures make me happy. Also, I am a huge fan of anything I haven’t had to cook myself. 11. What makes you happier than anything else? 1. I planned to never marry or have children. It is a source of continual shock and amusement/bewilderment to me that I am both married and have two children. 2. I was raised on a goat farm in rural NSW and know how to hand milk a goat. At some point I am hoping this skill will come in handy for me. 3. When I was a teenager I got obsessed with spinning and learnt how to spin my own wool. I sold my spinning wheel years ago though but I probably could still do it. 4. I started a website a few years back called Grain Free Living, where I write and blog about eating a gluten free and grain free diet. It (the diet, not the website) has helped my husband recover from severe crohn’s disease. Its the number one google website for a number of search terms related to being grain free. 5. I have a collection of 100+ year old poetry books. By collection I mean about 20 books. They are nice though. 6. You will never, ever, ever see me in shorts. 7. For those who know about the Myers Brigg Temperament Indicator Test – I am an INFJ. 8. I make my own Kefir. Its really cool and somewhat freaky how the grains ferment overnight to make the milk turn into yoghurt. Its very good for gut problems. Oh, and the move bit? Well, I mentioned it up above, but I have moved my sewing area from a rather messy corner of what was supposed to be our lounge room, into our spare bedroom. We decided that my hobby was not a passing phase and that the need for a proper space outweighed the few times per year that we have visitors staying. This move resulted in a complete reorganisation of the whole house as the room I took was being used by the 2 year old. So 6 year old got moved to the large spare room (she is in bliss, she really needed the extra space), the 2 year old got moved into the 6 year olds bedroom and I moved into the 2 year olds old bedroom. Everyone rotate to the right. Phew. I’m exhausted and feel like I have moved house, but am very glad that anyone coming to the house isn’t assaulted by my sewing mess and I no longer have to stress about sticky fingers or faces finding their way onto my fabric, or pins and scissors disturbingly going missing and turning up in dangerous locations. Next up: my finally finished Tiramisu #2 (sneak peak here) and I get to start on the Couture Dress project.